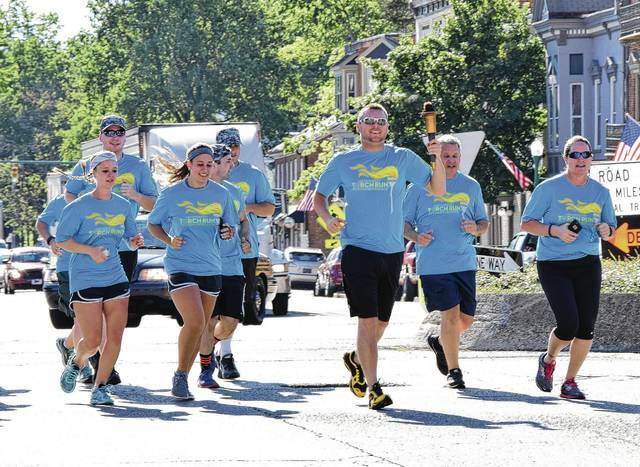 Members of the Urbana Police Division and Champaign County Sheriff’s Office took part Tuesday morning in the 31st annual Ohio Law Enforcement Torch Run benefiting Special Olympics Ohio. Participants in the local leg of the run traveled 2.5 miles from Kroger to the Depot Coffeehouse. Pictured carrying the “Flame of Hope” and leading the way through downtown Urbana is Ryan Black, a detective with the sheriff’s office.